The city of Istanbul, once Constantinople, purportedly hosts the tombs of many Sahaba, the revered Companions of the Prophet Muhammad. Though the city did not fall until 1453, when it was conquered by the Ottoman Sultan Mehmet II (d. 886/1481), Muslims forces campaigned against the city during the earliest decades of Islam’s irruption onto the world stage. The fifth Caliph Mu’āwiya (d. 60/680) directed a major campaign against Constantinople in the year 49/669, less than forty years after the Prophet’s death. In these earliest of days, it was often at the very walls of the city itself that some Companions of the Prophet reportedly breathed their last breath. The present post is the first of a series that will document the lives and alleged burial sites of many of these Sahaba. * By some counts, more than thirty such tombs are spread across the city. During our last visit to the city in May of 2012 we visited many- but far from all- of these in order to properly locate and photo-document them. It is hoped that this series will facilitate the future visits of other travelers and to shed further light on Istanbul’s importance for the tradition. 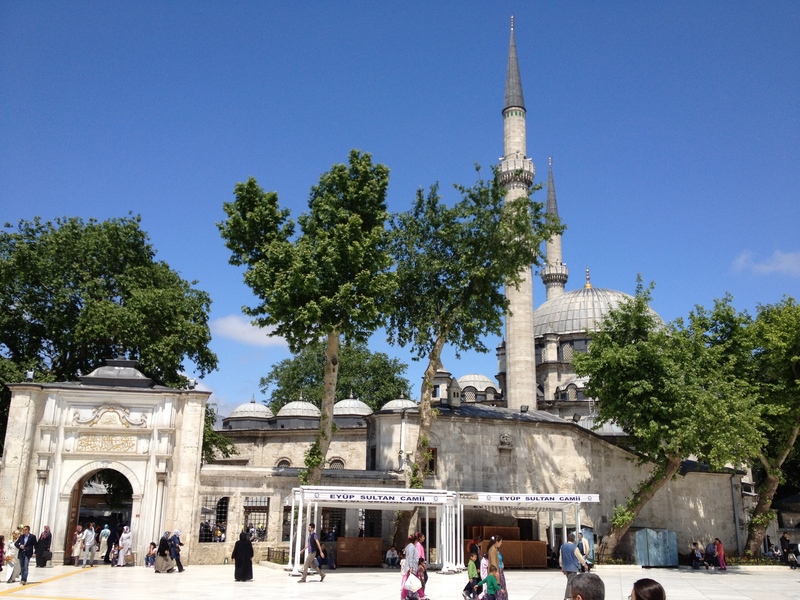 The Courtyard of Eyüp Sultan Camii. 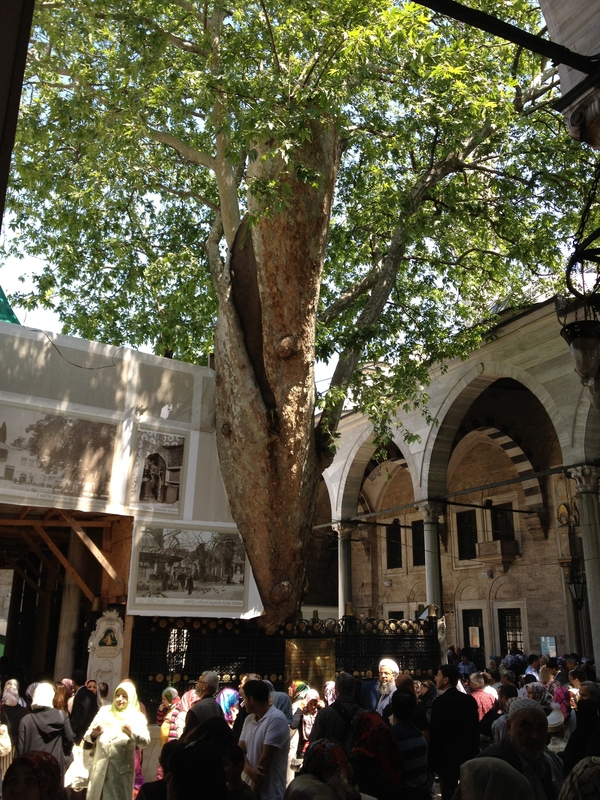 The tomb of Abū Ayyūb al-Anṣārī lies in an alcove just behind the tree. Among them was Abū Ayyūb. His name was Khālid b. Zayd b. Kulayb b. Tha’labah b. ‘Abd b. ‘Awf b. Ghanm b. Mālik b. al-Najjār. All [the biographers] are unanimous that he was one of the seventy Anṣār who swore allegiance to the Prophet on the night of the ‘Aqabah meeting. The Prophet established the bound of brotherhood (mu’ākhāh) between Abū Ayyūb and Muṣ’ab b. ‘Umayr. Abū Ayyūb participated in [the battles of] Badr, Uḥud, and the Ditch and all the [other] events on the Prophet’s side. As al-Ṭabarī has related, Abū Ayyūb was among the first Muslims of Medina. In fact, as Ibn Isḥāq and al-Balãdhūrī report, the Prophet took up residence with Abū Ayyūb when he first arrived in the city and stayed there until the mosque’s construction was completed (Ibn Isḥāq, The Life of Muhammad, 228-30; al-Balãdhūrī, The Origins of the Islamic State, 19). “Convey my salāms to the Muslim armies and say to them: ‘Abū Ayyūb urges you to penetrate deeply into the territory of the enemy as far as you can go, that you should carry him with you and that you should bury him under your feet at the walls of Constantinople. '” Then he breathed his last. 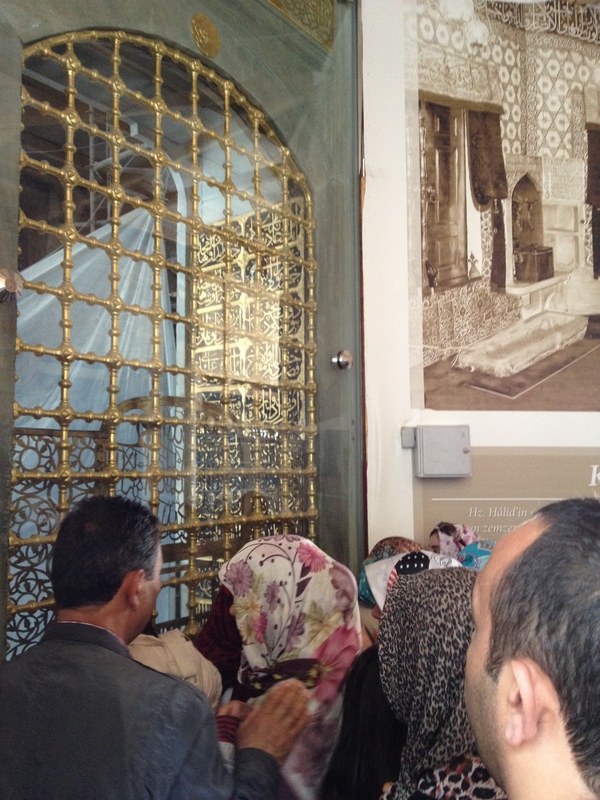 Visitors and pilgrims gathered before the tomb of Abū Ayyūb al-Anṣārī. *I say “alleged” simply because the history of such sites are more rich and complicated than they initially appear. Several of these sites, for example, were in fact places of veneration for the city’s Christians as well, well before the arrival of the Ottomans. Rather than wrestling with questions of historicity, the posts of this series will focus more on what the available narratives and sources have to report about the Companions supposedly buried in Istanbul. And to encourage more curious readers, I refer to English-language sources or English translations of primary sources wherever possible, though this may not always be maintained throughout the series. Finally, I try to provide dates both in the ḥijrī (Islamic calendar, AH) and Common Era (CE). al-Balãdhūrī, Abū l-‘Abbās Aḥmad b. Jābir. The Origins of the Islamic State: Kitāb Futūḥ al-buldān. Translated by Philip Khūri Hitti. Beirut: Khayats, 1966. Hāmid, AbdulWāhid. Companions of the Prophet, Book One, New Revised Edition. London: MELS, 1998, 153-8. Hitti, Philip K. History of the Arabs. New York, NY: Palgrave Macmillan, 2002. Muḥammad b. Isḥāq b. Yasār. The Life of Muhammad: A Translation of Isḥāq’s Sīrat Rasūl Allāh. Translated by A. Guillaume. Oxford: Oxford University Press, 2004. Sumner-Boyd, Hilary and John Freely. Strolling Through Istanbul: The Classic Guide to the City. London: Tauris Parke Paperbacks, 2010.
al-Ṭabarī, Muḥammad b. Jarīr. The History of al-Ṭabarī, Volume XVIII: Between Civil Wars: The Caliphate of Mu’āwiyah. Translated by Michael G. Morony. Albany: State University of New York Press, 1987.
al-Ṭabarī, Muḥammad b. Jarīr. The History of al-Ṭabarī, Volume XXXIX: Biographies of the Prophet’s Companions and Their Successors. Translated by Ella Landau-Tasseron. Albany: State University of New York Press, 1998. This entry was posted in History, Istanbul and tagged Abu Ayyub al-Ansari, Companions, Constantinople, Eyup, Istanbul, Sahaba, Tomb by Martin. Bookmark the permalink. Salams Martin, great work indeed! Being from Istanbul and having spent my childhood and youth in Istanbul, I wished that I had come up with this great idea myself! 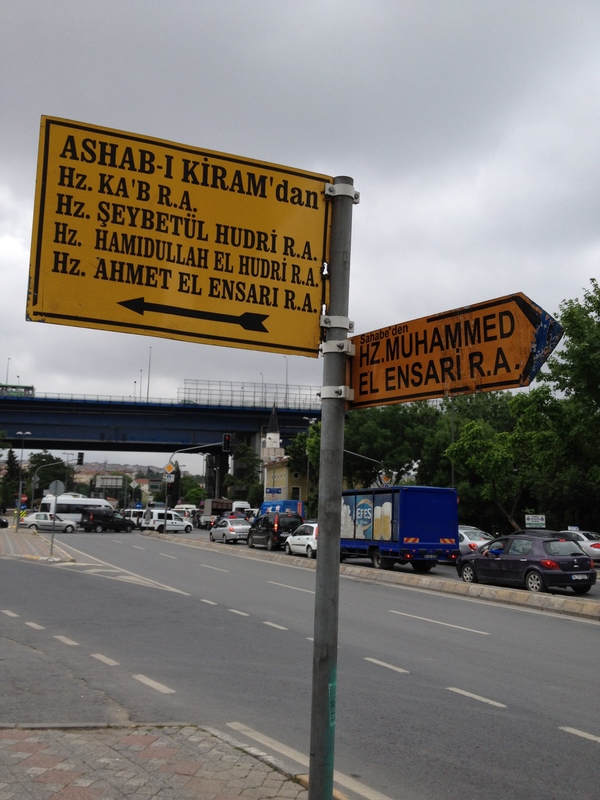 Thanks for your effort in documenting the sahaba in Istanbul. What a gem, masha’Allah. Salam Martin & Kiran, just found your site; am enjoying my visit(s) tremendously. Thank you for sharing the treasure-trove of stories, unfolding one beautiful parchment at a time. All the best–in travels & writings–to the both of you. Fi amaniLlah. Great reading and what a story of those pious determined men who came to cove such long distance from Madina and who took such an arduous effort at an old age of 80 years. The Prophet Hazrat Muhammad (PBUH/SAW) had forecast-ed the fall of Constantinople and confirmed the status of all those participating as Jannati. When i go and visit Istanbul i will first go and pay my tribute to the Sahaba and then go do any thing else.. and will leave after having seen them again- INSH AHLLAH!